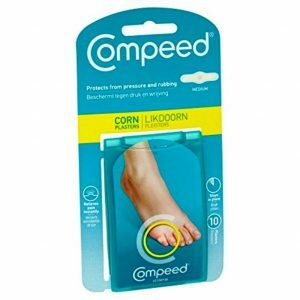 Corns are common skin conditions that often develop when a particular area of your foot suffers excessive pressure and friction which leads to thickening of the skin. The condition is easy to manage although you’ll need to use an appropriate corn treatment to achieve this. As such, we’ve compiled a list of six best corn treatments in the UK that will help you make more informed decisions when purchasing a treatment for yourself. Besides, we’ll also outline several key factors to consider when buying a corn treatment. This treatment comes in the form of a creamy substance that you’ll apply to the corn as well as the area surrounding it. Usually, these ointments contain salicylic acid which is very effective in peeling away any hardened skin patches. Can be used to treat other related skin conditions such as callus and verrucas. May not be appropriate for people with sensitive skins. Pickles Foot Ointment is one of the highly rated corn ointments available on the current market. It’s also incredibly effective as it contains 50% salicylic acid. When using this ointment, apply it to the affected area only as it can be very abrasive and possibly peel away even the unaffected skin. Corn gels are often thicker than water but thinner than creams. All you need is to apply a small amount of the gel to the area with the corn and leave it to dry. Most gels contain acids that aid in peeling away any overgrown skin that may have formed as a result of corns. Capable of removing even the hard corns. A lot of care is needed when applying the gel to prevent chaffing of the skin surrounding the affected area. Cuplex Gel is a highly effective corn gel that features a combination of salicylic acid and lactic acid. As such, this gel will help you shed even the hardest corns in a very short time. Besides, you can use the treatment to treat other related skin conditions such as verrucas. Corn plasters resemble those used for regular first aiding. They are specially made to cushion the affected skin area against friction while others come laced with acids to aid in the removal of hardened skin. Can be used to treat both the hard and soft corns. May not be appropriate when having multiple or very large corns. Corn liquids often resemble clear nail varnish and work more like first aid plasters. Most contain acids that help to peel away the hardened skin formed as a result of corns. Inappropriate for use on broken or cracked skin. 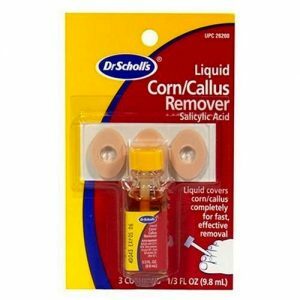 Coming with just 17% salicylic acid, Dr. Scholl’s Corn Liquid is recommended for use even by people with sensitive skins. As part of the kit, you will be provided with a foam plaster and a brush applicator. When applied daily, this product should help you get relief in less than two weeks. This treatment method entails the use of a precise blade which you can use to shave off the corn skin layer by layer. Appropriate even for hard and recurrent corns. You’ll need to replace blades severally. Featuring an easy-to-grip stainless steel handle, the Jewel of London Corn Plane will serve you impressively well as it doesn’t slip or break easily. The tool comes with very sharp blades to make corn removal easy and precise. However, you’ll need to learn how to use this tool properly if you’re to avoid damaging your skin. While this method is not meant to remove your corn, it will help protect you and give you relief when having other removal treatments. Protectors are available in various forms such as gel tube grips and foams. They are effective when used to ease pain and discomfort as they minimise friction or pressure exerted on a recuperating area. Can prevent corns from becoming bigger. Protectors do not remove corns. If you’re undergoing a long-term corn removal treatment, acquiring a Profoot Soft Gel Toe Protector will possibly be the best decision you’ll make. As such, this flexible gel tube is capable of fitting on any toe size as it’s made of stretchable materials. Considering that the protectors can be washed and reused, your cost of removing the corn will be lower than when using corn plasters. Having looked at the various types of over-the-counter remedies for corns, we now show you useful tips for buying the best corn treatment. Consider it as your corn treatment buying guide. It’s important for you to understand the severity of your corn which should help you determine the most effective method for it. For example, you may want to look for treatments with stronger acids when having seeking to remove a severe or recurring corn. You can choose between treatments that require direct application and those that offer a non-touch approach to corn removal. For example, if you have a sensitive skin, it’s important to avoid direct application techniques that can easily damage your skin. A majority of corn treatments today cost between £3 and £12. Find a treatment option that offers satisfactory results while also fitting in your budget. While some corn treatments promise to give quick results, most end up damaging your skin. This is why you should be extra careful when choosing a treatment option that offers immediate results. Soft corns are easier to remove than hard corns which is why milder treatment options such as gels and creams often treat them fast. Hard corns, on the other hand, may be stubborn to get rid of and will thus require more systematic treatments such as using corn planes. It’s important to seek professional help especially if over-the-counter treatments do not seem to offer desirable results. Some corns can cause pain to your skin while others swell which increases friction and ultimately worsen your condition. When having hard lumps all over your feet as a result of corns, it may become difficult to expose them in open shoes or walk barefooted. If left unattended, corns can crack and give way to various infections of the skin. If your condition reaches this point, it’s recommended that you seek professional treatment to avoid deterioration. Treating corns will also enhance the overall health of your feet. This method entails shaving off the hard skin using a scalpel. The procedure should only be done by a professional. Skin removal offers quick relief and won’t take much of your time to complete. However, you may need to repeat the procedure severally to get significant results. If your corns are facilitated by other foot conditions such as poor foot alignment or bunions, then having a foot alignment could solve the problem. As such, you may need to use insoles, toes positioners, or specialist shoes which relieve pressure from affected areas. This way, it’s easy to stop corns from reoccurring in future. While most over-the-counter corn treatments contain salicylic acid, they hardly contain concentrated amounts of the acid as found in professionally prescribed pastes. As such, you may consider seeking the latter option since it offers you quicker results. However, this method may not work for everyone especially if you suffer conditions such as poor circulation or diabetes. Q: How do I know whether it’s a corn or wart? Like calluses, corns are hard. That’s because they are simply dead skin. If you go to a dermatologist, they will carefully scrape some skin off the affected area. If it is a corn, nothing will happen. You’ll just see more hard dead skin underneath. If it is a wart, it might bleed. Corns are caused by constant friction and pressure on a specific area. Warts are viral. Q: Can corns disappear on their own? Sometimes they can go on their own when you change your footwear to stop the friction and pressure on the affected area. But you can use an over the counter treatment to treat them faster. If you have extra-thick corns, your doctor can trim them a bit to make walking and standing more comfortable. Q: Can corns get infected? Yes if you are not careful. If a corn becomes infected, you might have to take oral antibiotics. To avoid infection, keep your feet clean and dry. Wear sweat-absorbing socks and wash your feet every day.